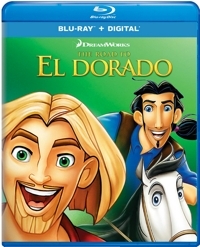 It’s hard to believe that it took almost 19 years for The Road to El Dorado to be released on Blu-ray, because it’s one of the best non-Disney animated films made during that period. With original songs by Elton John and solid direction from Bibo Bergeron (Shark Tale) and Don Paul (visual effects supervisor on Disney’s Who Framed Roger Rabbit, The Little Mermaid, Aladdin, and Pocohontas), it’s a sure-footed adventure comedy that sure should have made more money at the box office than it did. Kids will be taken in by the colors, the music, the action, and the humor, yet there’s enough here that will go over their heads and straight to the adults who are familiar with the classic Bing Crosby, Bob Hope, and Dorothy Lamour “road” pictures. The Road to El Dorado is as wonderful a homage to those classic comedies as Ishtar (with Warren Beatty and Dustin Hoffman as the adventurers) was an insult. 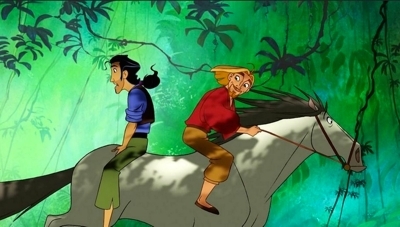 Set in 1519 Spain, The Road to El Dorado begins as many of the old road pictures did: showing the two men (in this case, Kevin Kline as Tulio and Kenneth Branagh as Miguel) doing what they do best, and that’s trying to work a con but narrowly escaping an angry mob. If the banter and the guarded closeness isn’t a tip-off that we’ve entered Hope and Crosby land, then the gambit they use (a pretend fight, ending with both of them punching out the man who’s threatening them) ought to jog a few memories. After they’re caught cheating at dice and end up hiding in barrels that get hoisted into the cargo hold of Cortes’ ship, they escape in a rowboat with a little help from Cortes’ horse, Altivo. Armed with a treasure map that they “won” in the dice game, they realize that they’ve landed at the starting point leading to El Dorado, the fabled city of gold that Cortes also seeks. Instead of Lamour, it’s Rosie Perez they encounter. She plays Chel, who’s stolen gold from the temple of the gods and was running away. But when the high priest sees the men and the horse, he matches it with a book of prophecies he has. Thinking the men gods (and Hope and Crosby had their share of such treatment), he takes them back to their hidden city. It’s clear that Tzekel-Kan (Armand Assante) is lauding his prophecy-come-true over the chief (Edward James Olmos), and that he’s the dangerous one. 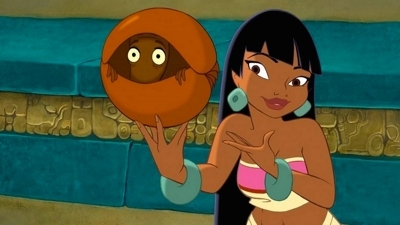 The rest of the set-up is that Chel, who witnesses the men talking about how sweet it was to be mistaken for gods, agrees to not blow the whistle on them as long as when they leave with the gold they take her as well. There are close calls, but the people love these new gods because they stop the practice of human sacrifice—which makes the high priest even more suspicious. Balancing the serious moments are plenty of comic ones, chief among them a ball game in which the two “gods” have to take on some rough looking characters on a team assembled by Tzekel-Kan (with a little comic relief provided by an armadillo who gets involved). It’s hard to tell whether the people of El Dorado are Aztec, Mayan, or a mixture, but ultimately that doesn’t matter. And while the cover suggests the kind of minimalist animation we get from Saturday morning cartoons, that’s not the case at all. The DreamWorks crew creates a richly textured world that’s full of detail. The water may not be as sophisticated as Disney’s, and the gold can seem differently rendered from other elements, but it’s still quite accomplished. 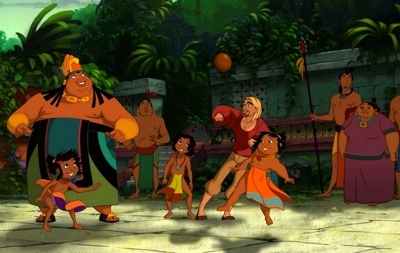 So I repeat, and with emphasis, The Road to El Dorado is an entertaining film that has first-class animation, a solid plot, plenty of clever lines, and characters we care about. And it’s an especially fun-to-watch homage to original road pictures like Road to Singapore (1940), Road to Zanzibar (1941), and Road to Bali (1952).